SPC Michael R. DeMarsico, age 20, volunteered to be "up front"', taking the lead of his battalion, protecting them and searching for dangerous IEDs. 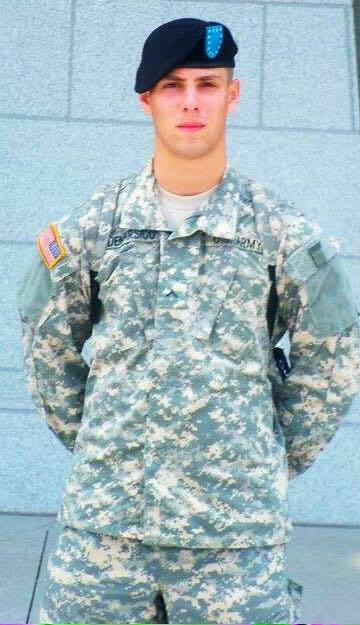 He lost his life in Afghanistan on August 16, 2012. He was a true American Hero! Please honor him, his sacrifice and those still serving. The Starting line is at the Veteran's Memorial at the intersection of Route 2 and Eagle Street. Runners will continue to Eagle St, crossing Main Street and continuing onto Ashland St. Walkers will turn around at the North Adams Armory and runners will continue on Ashland Street to South Church Street. Runners will turn into the BFAIR parking lot at 771 South Church Street, continue to the back of the lot where the water table is and then back out to exit, turning left onto South Churh Street. Runners and Walkers will follow Ashland Street and then turn left onto American Legion Drive. The race will finish at the American Legion. The course is a primarily open course with some police presence. Please be cautious of vehicles on the course. Please join us Friday evening, November 10, 2017 to pick up your race packet at the American Legion from 4pm to 7pm. This means you won't have to be out in the cold as early Sunday morning. Please enter me in the \"Up Front for DeMar\" race to benefit the SPC Michael R. DeMarsico Scholarship Fund. I agree to assume all responsibility for and all risk of damage or injury that may occur to me as a participant of this event. In consideration of being accepted as an entrant in this event, I hereby, for myself, my heirs, executors and administrators, release and discharge any and all sponsors of \"Up Front for DeMar\" from all claims, damages, rights of action, present or future whether the arising of, or incident to my participation in this event. I hereby certify that I am physically fit and have trained for competition in this event. I also grant permission for the use of my name and / or picture in any broadcast, photograph or other account of this event..